It was the 90's - things were different. Whether it's a 3 or a longggg 2 with a toe on the line, he's draining them. Just buried his 6th 3. Vick having so much more fun this year it seems. Lagerald Vick has now hit 907 three pointers tonight. 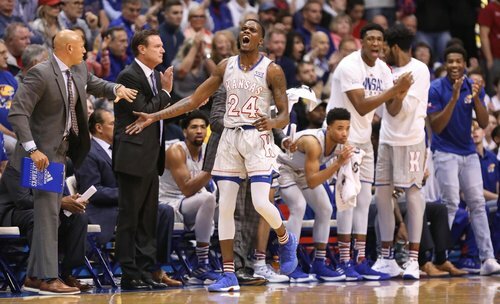 DEVELOPING: Lagerald Vick loves 3s. Oh mama. Vick is unconscious. #KUbball leads 59-45 and the senior has 27 on 7-of-7 from 3-point range. 10-12 from the field overall. Lamb loves to spin to his right. Does it nearly every time he gets the ball. Most 3-pointers in a game in #KUbball history: Terry Brown had 11 vs. NC State in 1991. Mario Chalmers and Billy Thomas each had 8 in a game. A KU player has made 7 triples eight different times. Brown had three of those. Udoka leads #KUBBALL in minutes tonight with 30. Someone likes to hear their whistle blow. Udoka now has 8 dunks. Just looked and Grimes has NINE!!! assists tonight. Started awful and really picked it up after that. #KUbball leads 78-62 with 4:07 to play and Dok gets a HUGE ovation as he heads to the bench. 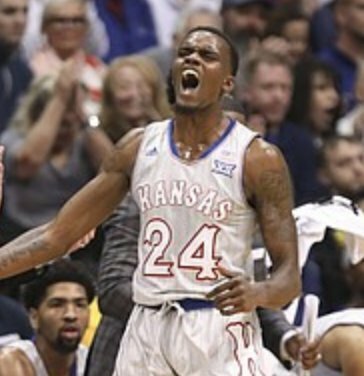 Lagerald Vick is breaking a record somewhere tonight. There's the 10th assist for Grimes and the 8th 3 for Vick. He's got 32 and only three other players in #KUbball history have had the kind of shooting night he's having tonight. Wow. "Lagerad, ah ah ah ah - were you just feeling it tonight?" "Ah ah was there something different tonight"
FINAL from AFH: #KUbball tops Vermont 84-68... Vick with 32 (8-of-8 3-pointers) and Udoka with 23 pushed KU to 2-0 on the season. KU plays host to Louisiana on Friday at 7 p.m.
Just counting 3’s after hitting another one. Quentin Grimes with 10 points and 10 assists. Self on Vick: I don't think I've coached a better offensive performance ever. 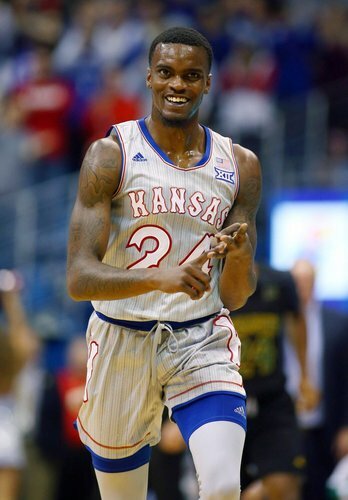 #kubball Vick could have had 10 3's but had 2 attempts with foot on the line. Thought Garrett and Moore were good off the bench. Self: Udoka went after the ball "rebounding like a man" tonight. Self: Don't read anything into McCormack not playing.